Researchers have developed a new compound which blocks the progression of Parkinson´s and Creutzfeldt-Jakob disease in mice with unprecedented efficacy. Research groups led by Armin Giese of LMU Munich and Christian Griesinger at the Max Planck Institute for Biophysical Chemistry in Göttingen have developed a chemical compound that slows down the onset and progression of Parkinson’s disease in mice. “The results look very promising. We hope that this approach will give us a way to treat the cause of Parkinson’s and so arrest its progress,” says Giese. The earliest signs of Parkinson’s disease can be deceptively mild. The first thing that movie star Michael J. Fox noticed was twitching of the little finger of his left hand. For years, he made light of the apparently harmless tic. But such tremors typically spread, while muscles stiffen up and directed movements take longer to carry out. More than 3 million people are thought to suffer from the condition worldwide, making it the second most common neurodegenerative illness after Alzheimer’s. The disease usually becomes manifest between the ages of 50 and 60, and results from the loss of dopamine-producing nerve cells in the substantia nigra, which is part of the midbrain. Under the microscope, the affected cells are seen to contain insoluble precipitates made up of a protein called alpha-synuclein. As an early step in the pathological cascade, this protein forms so-called oligomers, tiny aggregates consisting of small numbers of alpha-synuclein molecules, which are apparently highly neurotoxic. By the time the first overt symptoms appear in humans, more than half of the vulnerable cells have already been lost. Many researchers therefore focus on developing methods for early diagnosis of the condition. However, current therapies only alleviate symptoms, so the research teams led by Armin Giese and Christian Griesinger set out to address the underlying cause of nerve-cell death. Together, the scientists have developed a substance which, in mouse models of the disease, reduces the rate of growth of the protein deposits and delays nerve cell degeneration to a yet unprecedented degree. As a consequence, mice treated with this agent remain disease-free for longer than non-medicated controls. “The most striking feature of the new compound is that it is the first that directly targets oligomers and interferes with their formation,” explains Christian Griesinger, head of the Department of NMR-based Structural Biology and Director at the Max Planck Institute for Biophysical Chemistry. The discovery is the result of years of hard work. “Combining skills from a range of disciplines has been the key to our success. Biologists, chemists, clinicians, physicists, and veterinarians have all contributed to the development of the therapeutic compound,” adds Armin Giese, who leads a research group at LMU’s Center for Neuropathology and Prion Research. Giese and his colleagues systematically tested 20,000 candidate substances for the ability to block formation of the protein deposits that are typical for the disease. The screen made use of an extremely sensitive laser-based assay developed by Giese years ago when he was working together with Nobel Laureate Manfred Eigen at the Max Planck Institute for Biophysical Chemistry in Göttingen. Some interesting lead compounds identified during the very first phase of the screening program served as starting point for further optimization. Ultimately, one substance proved to be particularly active. Andrei Leonov, a chemist in Griesinger’s team, finally succeeded in synthesizing a pharmaceutically promising derivative. This is well tolerated at dosage levels with significant therapeutic effects, can be administered with the food, and penetrates the blood-brain barrier, reaching high levels in the brain. The two teams have already applied for a patent on the compound, which they called Anle138b – an abbreviation of Andrei Leonov’s first name and surname. Generally speaking, the earlier the onset of treatment, the longer the animals remained disease free. 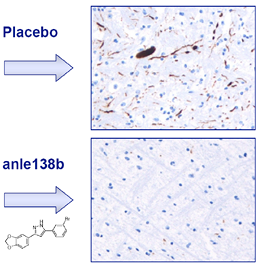 What’s more, the beneficial effects of Anle138b are not restricted to animals with Parkinson’s disease. “Creutzfeldt-Jakob disease is caused by toxic aggregates of the prion protein,” Griesinger points out. “And here too, Anle138b effectively inhibits clumping and significantly increases survival times.” These findings hint that Anle138b might also prevent the formation of insoluble deposits formed by other proteins, such as the tau protein that is associated with Alzheimer’s disease. Further experiments will address this issue. Anle138b will therefore be a useful research tool in medicine, as it will enable scientists to study the process of oligomer formation in the test-tube and to determine how their assembly is inhibited. The researchers hope ultimately to gain new insights into how neurodegenerative disorders develop.